I read this article and found it very interesting, thought it might be something for you. The article is called High probability methods for FOREX Trading and is located at https://howtogetref.com/leading-indicators-forex-trading/. In this article, I’m going to explain why I think leading indicators are a superior tool for traders than lagging indicators. If you have seen some of my trading charts, you will notice the absence of a bunch of indicators along with the asset price. That is because I want to focus on the price action to take trading decisions. Lagging indicators such as MACD, RSI, etc. are calculated using the asset price applying a formula. For each new bar (or candle) we get a new value for the indicator. That makes the indicator to “wait” for each new bar to close to provide a new value, that is why they are called “lagging” indicators. If you are familiar with these indicators, you probably already notice that your entries seem to be always “late to the party,” having bad entries even if you pick the right direction. The problem with this is you end up needing bigger stop-loss thus reducing your risk/reward ratio which is dreadful in the long run for your trading account. The benefit of leading indicators is they provide areas where the price has a higher probability to go, and they do that in advance, so you have time to plan your entry and exit. Some leading indicators are Fibonacci retracements, support/resistance levels, trend lines, channels, pitchforks, etc. 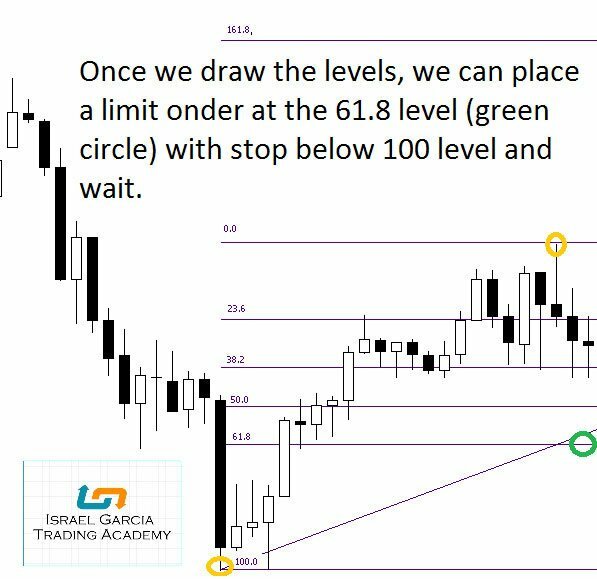 So let me share with you how I use Fibonacci retracements. I won’t explain who Fibonacci was since you can go online and find a lot of information also I’m trying to keep this article as short and to the point as I can. 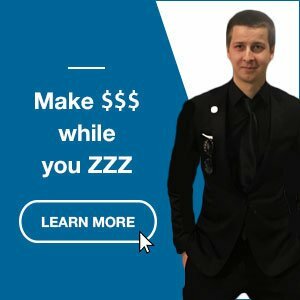 My goal is to provide you something you can implement right away you help you get better results in your trading with real examples. So here we go, the Fibonacci retracements tool might differ a little bit depending on the trading platform you use, but it is included for free in if not all, most of the platforms. (Check out Fibonacci tool at etoro trading platform: here). In the next example, we are looking for an opportunity to enter long (buy first, then sell later). Later on, in this article, I will show you how to apply the same principle to enter short (sell first and buy later). 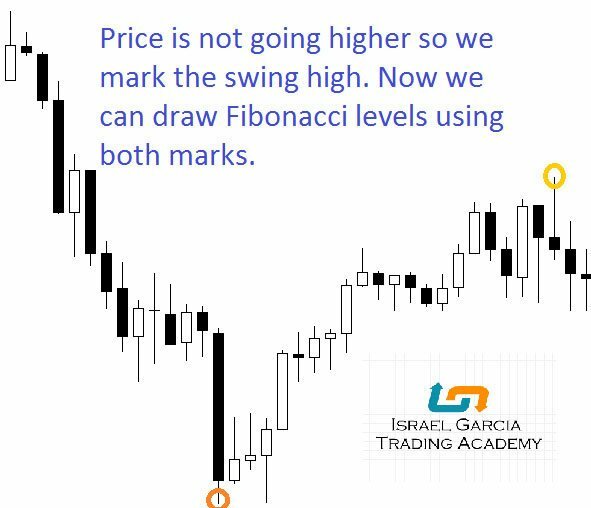 To implement it, first we need to identify a change in the price trend, after that, we take the lowest part of the swing and the highest part of the swing to get the Fibonacci retracement lines in our chart. Now we look for the second mark we need to draw the Fibonacci levels. Now we draw the levels and place our entry order according to the levels. Please note depending on the trading platform and the order in which you set your swing high or swing low; you can get the level marked as 61.8 or 38.2, what is important is you want to pick the one that has more than 50% retracement. That is, the price needs to pull back more than half of the way it did in the movement you are measuring and then pick that level no matter it is marked as 61.8 or 38.2. The order is filled, and we take half at 0 level and the other half at 161.8 level. This method works when price goes up and also when it goes down. 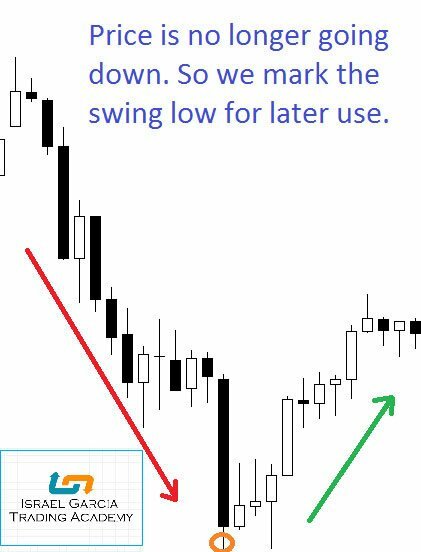 Now we have seen this example of long entry we can see the same concept applied to short trade in the next picture. Hope this method helps you improve your trading results. In next articles, I will show you how to implement the other leading indicators and how to use them together. In the meantime, please comment below if you found this article useful. Also please let me know if you disagree and why. Thank you!. Trade the markets with confidence. It will be great to follow your tutorials, tips, and tricks over the next few days. Correct, as Tanguy mentioned, I’ll be posting soon more info about Forex trading.